Marcus Luttrell's blockbuster bestseller, Lone Survivor—soon to be a major motion picture*—*tells the story of Operation Red Wings, in which four U.S. Navy SEALs were inserted into the mountains of eastern Afghanistan with the task of collecting intelligence and finding—or killing—a top al Qaeda commander. The SEALs were ambushed by over one hundred Taliban fighters and a horrific battle ensued. The rescue helicopter carrying eight SEALs was shot down by a reported Rocket Propelled Grenade (RPG), killing them instantly and erasing any hope for the SEALs already on the ground. Luttrell was the only survivor. 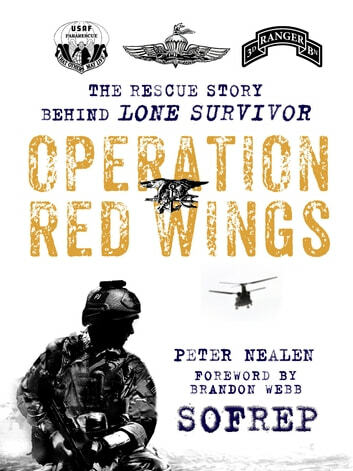 OPERATION RED WINGS is an in-depth examination of the recovery mission to rescue Luttrell, filled with never-before-told details and shocking new revelations. Author Peter Nealen (former USMC Force Recon) and the team at SOFREP have an expansive network within the Special Operations community, providing them with access to exclusive interviews, after action reports, military intel and previously untold accounts of the rescue mission. Nealen and his team have uncovered eyewitness reports that put the "official" story into question as to how the initial rescue helicopter was shot down. If true, this potential coverup will have had severe consequences on subsequent helicopter insertion operations and put lives at risk. Complete with a foreword by former Navy SEAL Brandon Webb, this is a must-have companion to the blockbuster book and upcoming film. Goede beschrijving van de gebeurtenissen die hebben geleid tot de redding van "alone Survivor" en die het leven heeft gekost van vele bij de operatie betrokkenen. Laat het falen van de interne communicatie zien van zo'n grote en complexe organisatie als het Amerikaanse leger. Geen oordeel maar een constatering. Boek is opgebouwd uit gebeurtenissen van dag tot dag maar blijft desondanks spannend.